The Great Depression hardly seems like a good time to start a business, yet it was in 1932 that Muncie Aviation opened its hangar doors and welcomed early aviation enthusiasts. Despite the economy, it was an exciting time to enter the business of aviation. Founded by Edmund F. Ball, son of the Ball Brothers known for manufacturing Ball Glass Jars, the company benefitted from the family’s support in its early years. Aviation was still a relatively new industry back then, and pilots who took to the skies tended to be showmen, enthusiasts, and risk-takers. 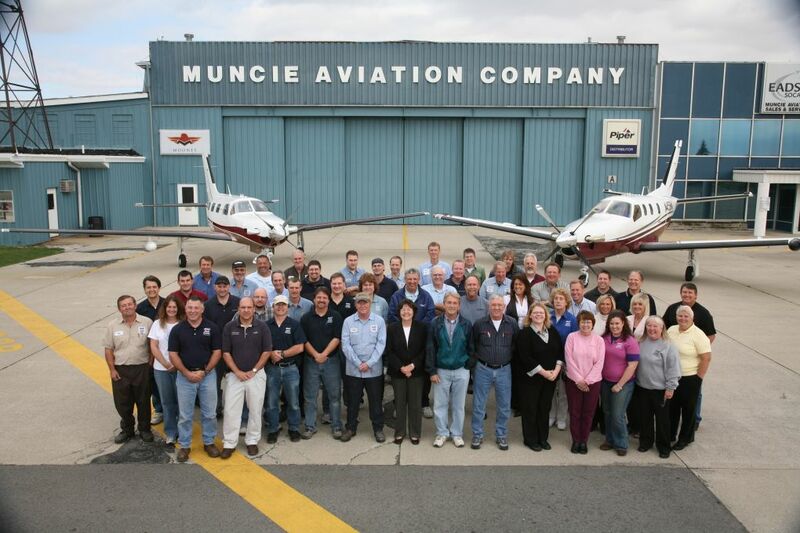 Muncie Aviation catered to this crowd both as a service provider and dealer for Waco. They added Beechcraft and Aeronca sales soon after. In 1936, the company began offering what would become the iconic Piper J-2 Cub, establishing a relationship with Piper that continues to this day, making them the oldest Piper dealer in the world. FBO’s come and go, but you don’t see that at Muncie Aviation. They have continued to build a strong reputation in the field as a top-notch, full-service FBO which not only serves thousands of pilots, but hundreds of other FBOs around the country through their parts service department. They are also unique among many FBO’s in that they own much of the grounds around the airport – about 330 acres. According to Muncie Aviation President Martin Ingram, 93% of the traffic into the Delaware County Regional Airport on which the company sits fly in expressly to do business with Muncie Aviation. In 2004, the company was sold to its employees by the Ball family, and is now organized under an ESOP, or Employee Stock Ownership Program. That means it is now a 100% employee-owned company. Every single person who customers interact with – from the person who parks the airplane all the way up to Ingram himself, is an owner. Every employee owns shares in the company, which means they have a vested interest in its success. On average, Muncie Aviation sells about twenty-five aircraft a year, nearly all TBMs and new Pipers. They focus primarily on sales of new and late model aircraft. Service and parts make up a big part of what they do as well. They now employ twelve avionics technicians on site, and continue to expand that part of their business as well. Though the types of customers the company welcomes have changed over the years –from barnstormers and risk-takers to professional pilots and licensed enthusiasts – the company’s dedication to the industry remains stronger than ever.